This is my most favourite of Christmas crafts. 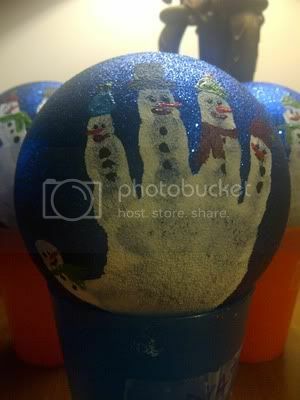 Using my buddies handprints, I create a lovely snowman ornament for the tree. It makes a beautiful Christmas present and my buddies' parents look forward to getting them each year. I prefer to use blue glitter balls to create these ornaments. The blue contrasts nicely with the white, and makes a night sky backdrop for them. The glitter works wonders to keep my buddies hands from sliding and smearing the handprint. This is especially great for my youngest buddies. I simply paint each child's hand with white acrylic paint and have them grasp the ball from the bottom, with fingers reaching up. The fingers will become the "snowmen". I set the balls in a cup to dry and when the paint is dry, I add details. I use acrylic paints and fine paintbrushes. The task of adding details would be made much simpler with paint markers, but I didn't have those. I add eyes, carrot noses, mouths, buttons, scarves, hats and any other details that seem to work. 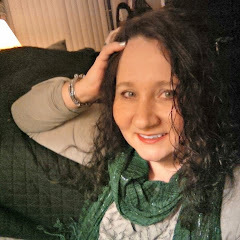 They are super cute, and sure to please my buddies' parents!